Advice and stories on making your own “partner track” moderated by FirstMark Capital and featuring Brooklyn Bridge Ventures, Female Founders Fund, Lattice Ventures, and PeakSpan Capital. This was another rockstar panel. 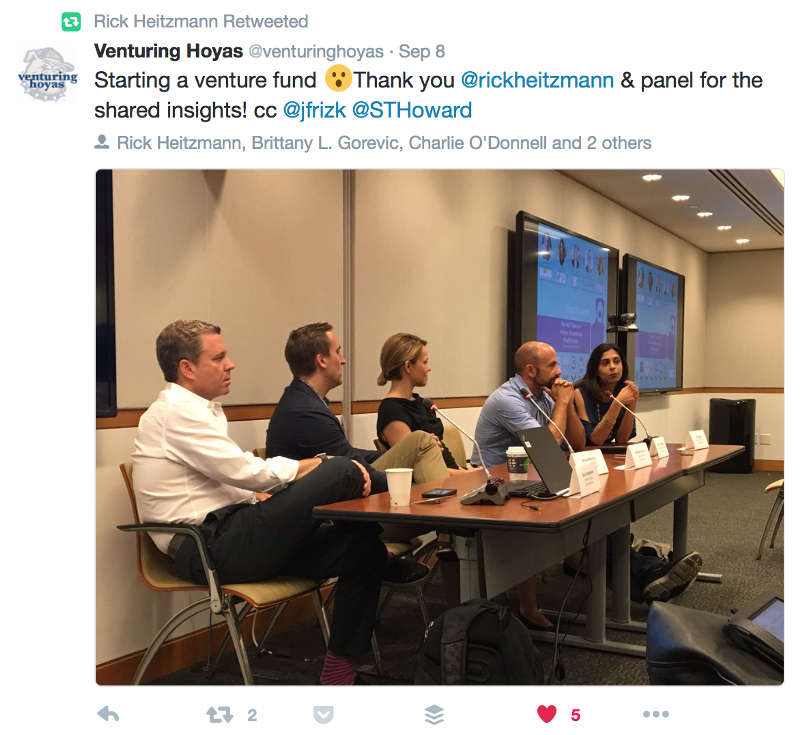 Was super fortunate to have Rick, Charlie, Anu, Brittany, and Brian as panelists offering a diverse set of perspectives in fund size, experience, routes to vc, competitive differentiation, and even time to first close. You can see that breadth of perspective laid out in the notes below. The conversation was both forthcoming and fun — something which can only really be felt in the room, but I’ve done by best to capture some of that. Enjoy the show notes, please share with friends who may be interested, and I hope to see you at one of our future events. Follow me @sthoward to find out about them. Rick: What lets you differentiate your fund? Charlie: I had worked at USV but was still worried about competing with existing firms without a brand name fund of my own. So I thought I’d write smaller checks since, as those other funds have grown so have their check sizes. Seed has changed. Entrepreneurs are being told “you are too early” so now there is pre-seed. So it turns out I did not have to write small checks. My fund size is a bit bigger and as competitive as seed gets you see people leaving it. Brittany: We write $50k checks so not the sole check. We saw two things. First, there was not a lot of education around how seed impacts later rounds. Lots of entrepreneurs are offered money so they take it and they don’t really understand how those initial terms affect later capital. We fill that education gap. Second, entrepreneurs are diverse and many lack a network. Not everyone is like a Mark Zuckerberg and goes to a school where their peers can give them capital. We try to make ourselves available to provide a source of capital to diverse entrepreneurs. Brian: Success breeds competition and VC is no exception. 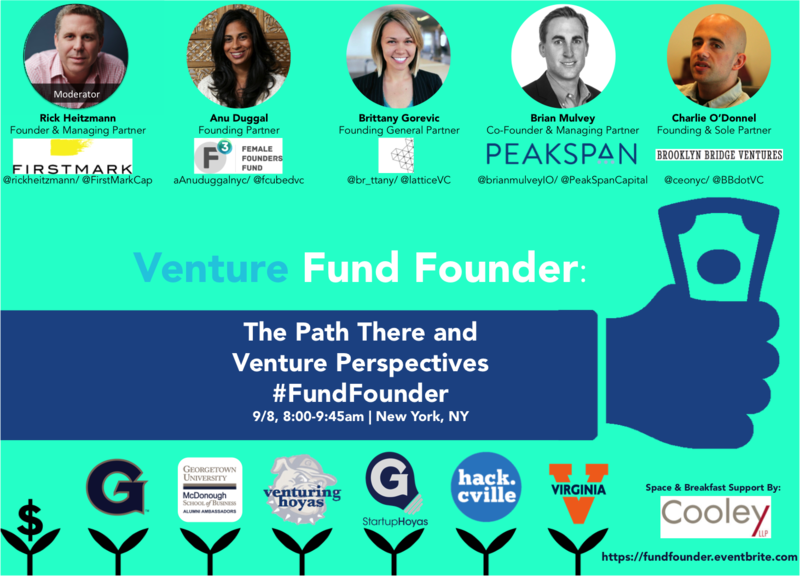 Cambridge says there are over 50 funds in the NYC market alone and traditionally they’ve operated on the cold call model — get yourselves in front of the entrepreneurs. Your Summits and Insights have raised bigger funds and kept same partner size, so they have to write bigger checks. We invest with a $7–10m check size and a lot of firms cannot invest at that level. There are 8–10 themes we are experts in and we stick to them. It’s about having a Lingue franca so when you take a board seat, you can talk with the entrepreneur at the right level. Rick: Everybody has a boss. We have LPs. When you started out, how did you establish credibility? Anu: Starting a first time fund is really hard. It takes a lot. I didn’t have a track record in investing so getting people to give you money is a bet on you. I reached out to operators who could help. If they said no I asked for another intro. Those who said yes we’re very helpful and made more intros too. Charlie: When I started, I had a check promised from a wealthy individual. Then I posted that I was raising a fund and I got inbound requests, one from a hedge fund that looked like they would be a big part of my first fund. I thought, wow this is going to be easy. I answered every question from the hedge fund and then four months later I asked, “So, how do we close this thing?” They told me that they wanted to hire a Director of Fund Strategy and assess the options. I asked what their timeline was and they said probably 6 months. I asked how much they could commit to and they said a million. I said great, I’ll pencil you in for a million in September. Then I went back to my high net worth individual and it turned out this person wanted to be more of a partner and when I said that was not an option, they bailed. So I had been at this for 6 months and had zero to show for it. Then I decided I needed to run it like a sales process. The key thing for me is being very targeted — that’s how to qualify an individual. It’s needs to be more than money, they need to be interested. I ask if they are interested in venture capital because if they aren’t into the asset class, you can’t convince them to like it. I ask them what check size both minimum and max. And I ask if they are comfortable with the fund structure. They have to be ok with not being a decision maker and paying a management fee. I won’t take a meeting unless they say “yes” to those three. It’s hard to sell money to rich people, they have it already. They are trading wealth for interest. Why would they be interested? They like the space, they want network access, or they want to be involved with entrepreneurs. Brittany: Charlie and Anu’s points are great, I actually reached out to both of them when starting my fund. The best advice I have to add is that both fast “nos” and fast “yesses” are the best. It’s the slow ones that waste your time. Charlie: Did you get intros to LPs from other funds? Anu: yes, I did - from you. Brian: I ask several questions when vetting an LP. Do you invest in Growth? Do you invest in Tech? Growth as an asset class has only been a consideration in the last four years or so. Then I also try to follow advice I got which is around “Level” — find people who look like you. By that I mean they are also up and coming. Look to the VP or young partner level not at the top. They will be growing with you. Rick: My first was fund raise was in 2005. The second was in 2009 while Bear and Lehman collapsed, so was like a first time raise again. Rick: How do you see funds evolving over next 10 years? Brittany: VC as an asset class is ripe for disruption. We had conversations at USV all the time. As VCs, we believe in innovation and disruption so we need to be looking at how we can disrupt ourselves. There are two areas where I think this is most likely: in fundraising and exits. We’re going to see changes in fundraise structures and how people invest. More investors can get involved. The UK, for example, has no restrictions on who can invest yet the US does. People here should be able to do that. On Exits — acquisitions and IPOs are traditional but private companies can stay so longer. Look at Uber. That means new paths to liquidity are going to gain importance. Charlie: I think we’ll see more solo efforts. We’re in the middle of the gig economy and a world of freelancers. People make trade offs. 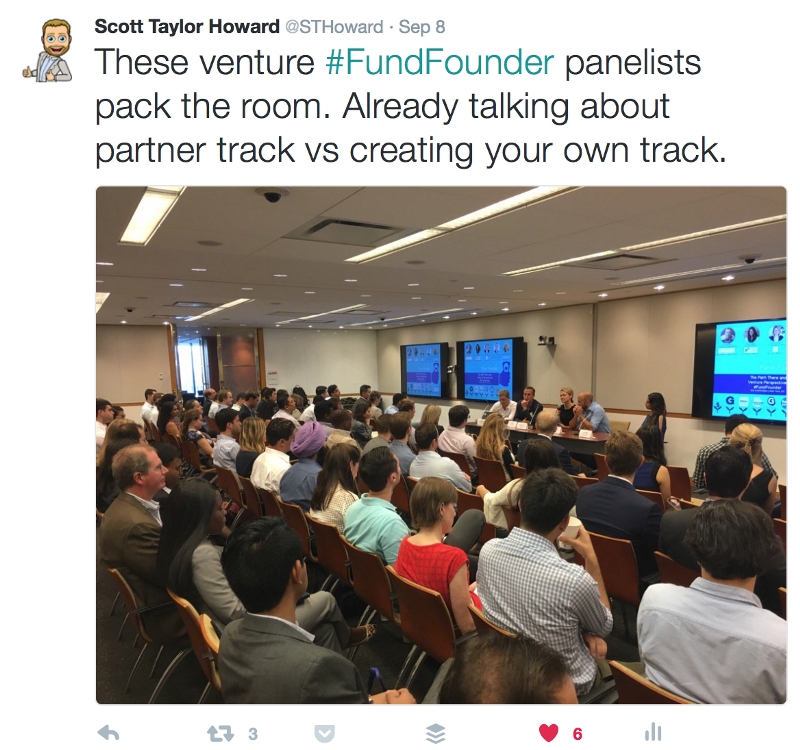 Four years ago, VCs would ask me how to make a small fund work and now they ask how great it is to not have a partner meeting. Nobody asks me about “go” decision making. At the early stage where I invest, the companies don’t look like anything so if you if you need to explain to group of 10 people why this entrepreneur you’ve known for a year or more should be invested in, you won’t get there. From my investment past, research showed that consistency was correlated to results. So if you start small, stay small. You see firm drift a lot, from a fund of $50M to a fund of $1B. They’ll struggle to make that work. I think you’ll see more solo efforts. Brian: You ever bringing a partner on? Charlie: No, but thanks for asking to join me. Seriously, I don’t believe an extra partner would double my funnel and I’ll just get angy if they lose money. Anu: VC is still a bit of a secretive world. Crowd funding, etc makes it interesting and perhaps more open. Platforms like Circle Up and similar show lots of opportunity for change. Brian: Everyone knows the Andreesen article on software eating the world. Similarly, we built a platform. It doesn’t drive our decision-making but it does enable relationships by putting a fund partner on phone with an entrepreneur early. 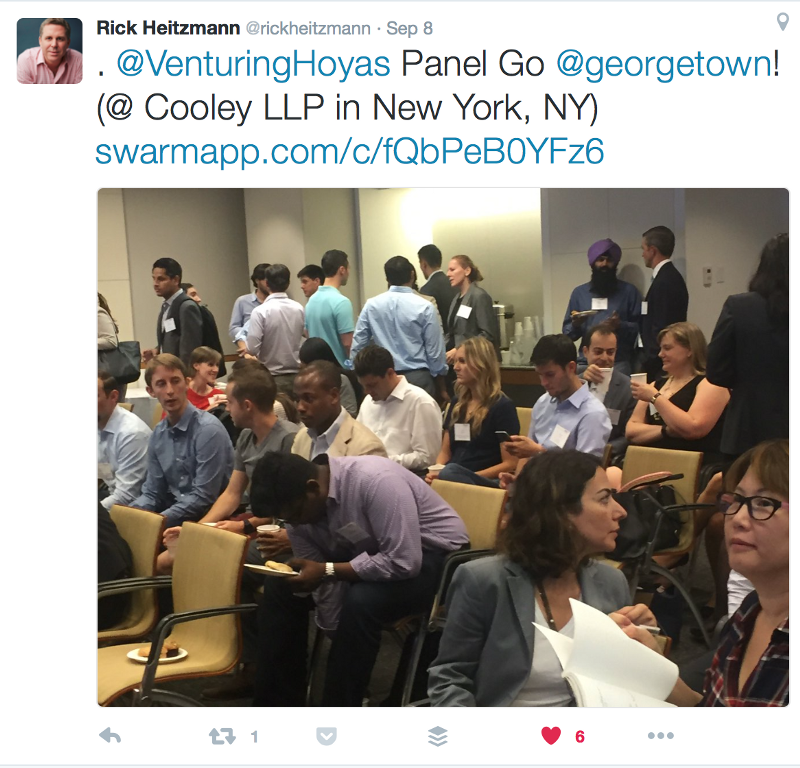 Rick: What was something you learned as you set up a fund? Charlie: Institution will make you do a fund model. You have to consider the fund size, number of deals, check size, assume a number of successes and work in fees. I am stunned at how many have not done the math and figured out deals and follow on. It really is crucial. Like all models, it will be wrong but you will understand it and be able to explain your business better. Brittany: VC is a business. You have to understand it and plan for risks. VC is a human capital business. Take inventory of the people you know who are valuable but also that you can give back to. It goes both ways. Brian: The fundraising process still involves a lot of luck. There are many points of failure. It took us 2 years to raise. We went to bankers and lawyers we knew and that was about half. They also serve as good references. Cambridge is important in growth. We became a supported fund during the course of our process. When talking to family offices, they often don’t have the resources to diligence you. Cambridge can act as a “stamp” for LPs. Rick: We use Cambridge as sales channel. Brian: Right a stamp, not money source for us. Charlie: How long till each of your first closes? Rick: What role does your investment thesis play? Rick: It’s overly important to have you first deal on thesis. LPS will wait for last close because they can. They want to see 2–3 deals. Our closing took 18 months, and they know you won’t turn away the money so they can wait and see how you stick to your thesis. It will just raise many extra questions if you do not stick to it. Elephant had a deal in pocket already and did the first deal and close quickly thereafter. Made the second close fast. Brian: The second fund should be easier to raise. No edit expected, must stick to your strategy. All of your deals must be on point because if we drift I’d worry about credibility. Rick: Our first 10 years we had to be on thesis. Around fund 3 or 4 you start to say flexibility matters and you must evolve and disrupt yourself. It is a business about making money for LPs. If you have a relationship outside your core with an entrepreneur and you think it will make money you go there. We have since created a new product line for opportunity outside of our core. That first fund drives exits and credibility and then you can get some leverage in what you do. Charlie: When thinking thesis, keep in mind the long term. A decade or more even. Think about the tech landscape over the last ten years and how much it has changed and how much some theses have changed. My thesis is that there will be interesting early stage deals in NY. Q. What data do u provide LPs? Rick: Ours, we aim for quarterly and to provide enough but not too much. If you give a lot of granularity early it becomes expected. We provide more information during a fundraise. Charlie: Depend if it’s institutional or other. Institutions have many investments and they may not even look if you send them information. Individuals may want engagement so I’ve doubled down on engagement with my LPs and entrepreneurs. My investments are early so there is not much data. We do quarterly events and bring 2–3 entrepreneurs to pitch. They can test their next fundraise even. It’s a good opportunity for them and it reduces pressure on me to create content. Brian: We offer co-investment opportunities on all of our investments. It’s part of our documents. So we send robust memos. Brian: It’s contractual — a small percent and first close participants get priority. A third of the investments in our first fund did co-investments. Charlie: I wouldn’t do it in case it slows down the process. Brian: the timing is also in the contract. Q. What role does platform play for your funds? Brittany: I formerly ran platform at USV. We had 50 companies and they become part of our operator network. A number won’t start a fund or become LPs, but they like to be involved. My partner also has a strong network around investing. We are trying to load the ecosystem for our investments. Lots of value exists in some platforms to leverage each other. Some questions are technical and not necessarily an area of expertise, so that really shows the value of a strong network. Charlie: You don’t need a platform to tell you questions to ask a sales person. There’s a Medium post for that. There’s probably a dozen Medium posts for that. A small fund must add value without taking much time. We do a lot around technical recruiting. 4–5 speakers on a topic and we bring in developers. Sometimes one of our companies is hiring and sometimes we offer the events to others. These events also end up being deal flow. Rick: We have 5 people on platform type roles. The first 5 years this was nights and weekends for us. That’s due to the fact that we were new and did not have a lot of companies in our portfolio. Need to find ways to leverage peers. Use google groups. Share hiring and compensation questions. Have a range of founders to talk to. Q. Last thoughts on raising a fund? Charlie: If you are raising and publicly announce, be careful. If you are vague and public, someone can ask you. If you are too specific, the lawyers get nervous. Work with a good law firm who will tell you what you can’t say. You do have to say something though. It’s very hard to raise a fund if nobody knows you are doing it.